I don’t believe in “good” guys and “bad” guys. It’s a cognitive distortion to believe that people fall fully into one of two camps. Or to forget that we are constantly fluid, and capable of wonderful and terrible things, under certain circumstances. So, to base conversations, debates, or policy on that belief is usually ineffective. This kind of polarized thinking has been harmful to humanity. It breeds judgment and separation. I understand why we do it. To feel safe in the world, we want to believe in polarity. It’s clear and easy. That way, we can identify the bad people, or the bad behaviors, and avoid them to be safe. But, unfortunately, it doesn’t work that way. Humans—our minds, bodies and behaviors—exist on a spectrum. We may move around on that spectrum, throughout our life. As someone who works with trauma clients, I observe that most people were traumatized by a trusted person—a sibling, a parent, a teacher or coach, a date or a partner. People, who, by social standards, walk around as “good” people—before AND after they perpetrated a hurtful act toward another. Many people who have been victimized will not report a trusted perpetrator, because the cognitive dissonance is so deep. They can’t reconcile that someone “good” harmed them. Putting people in two camps will not keep us safe, and it’s not effective. It is a distraction to solving underlying issues that contribute to harmful behaviors from any, and all, humans. Putting people in these two camps, from the beginning of our lives, which is often what occurs, can lead to the very behaviors we seek to avoid. Labeling a child as good, or bad, can create a shame or fear spiral, from which they never recover. That spiral can lead people to harm others. After all, according to how we treat many of our young people, once you are already in the “bad” camp, there’s no hope for you—a self-fulfilling prophecy. 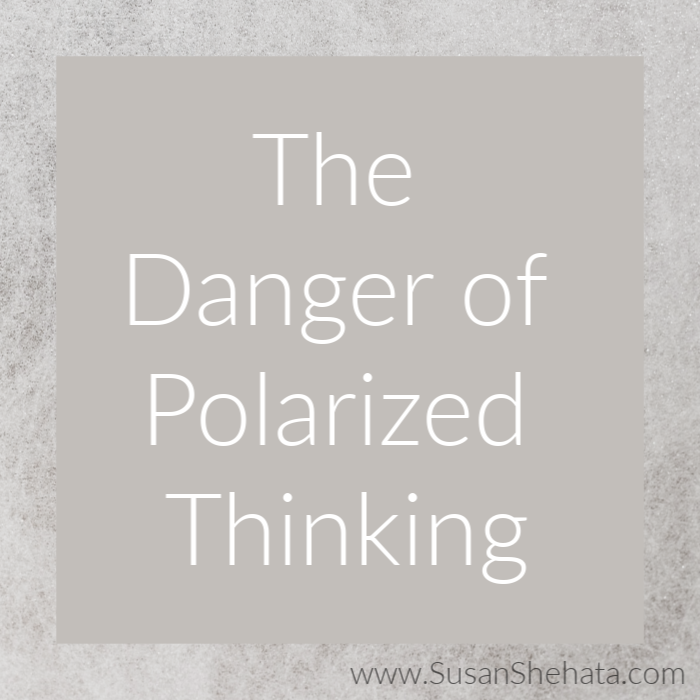 Polarization is one of the primary themes I teach about. I do appreciate contrast. It has value and I think that we can learn from it, in certain situations. But, I also ask you to please consider the damage that polarized thinking has on you as an individual, your families and on our society.